New ABD2000 Bulk Depalletizer features full height fully automatic Bulk Depalletizer having a standard metal line of 151″ unless otherwise specified, with the following features. 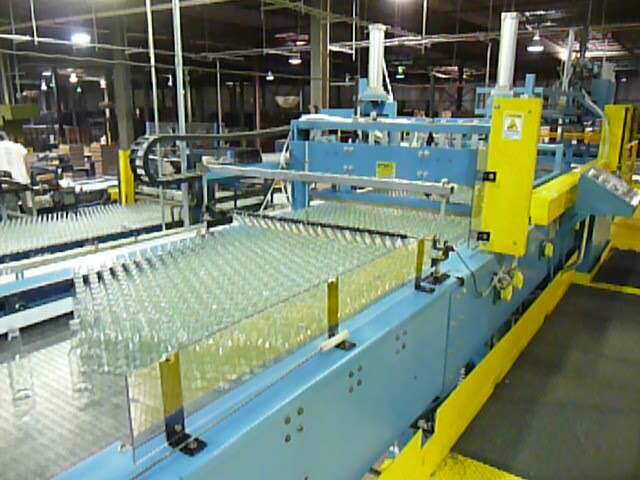 Automatic pallet stacker, empty pallet conveyor (top of chain height set at 24″ elevation unless otherwise specified), automatic tier sheet and top frame removal, three sections of full pallet conveyor included. Allen-Bradley PLC control with safety light curtains, Rexnord 7705 matt chain on the accumulation bed, and sweep carriage stabilizing bar. Can quote discharge single filer separately.